Hello my fellow bloggers! So sorry for the delay in posts, I've been super busy the last few days and finally have time to sit down and write! So just to update you, I'm leaving my work in the Montessori so I've applied to a few places and received a call from 2 of them inviting me in for an interview. One of them is for Brown Thomas and the other is TV3. So today and tomorrow are important days!! Fingers crossed one of them will call back with good news! 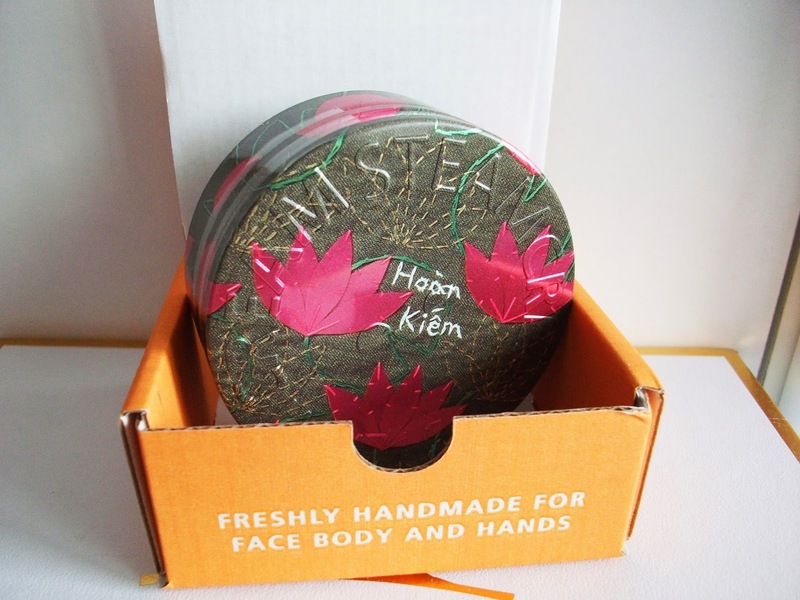 "Freshly handmade using high-quality, natural ingredients that are fused together by a shot of steam. This unique method makes the cream very lightweight, providing long-lasting hydration for the face. The texture also makes it a perfect nourishing treat for your body and hands too. 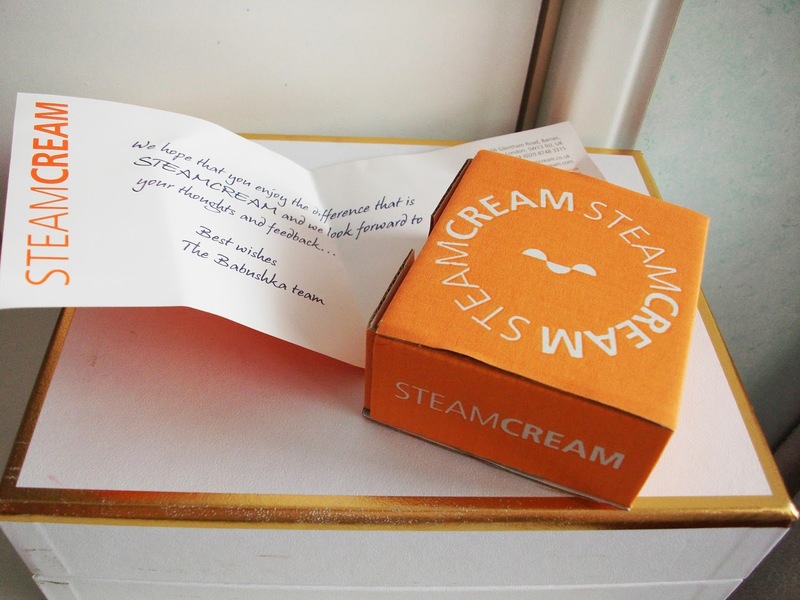 STEAMCREAM is handmade in the UK and Japan with fresh, traceable ingredients. It’s super-moisturising, sinks deep down instantly and revives your skin straight away. It makes your skin simply the best it can be, naturally." The second I opened the box I was in awe at how beautiful it is! The artwork on it is so unique and it really is a one of a kind product. I'd have bought the tin if I saw it in the shops so the cream inside it is like a bonus! hehehe. 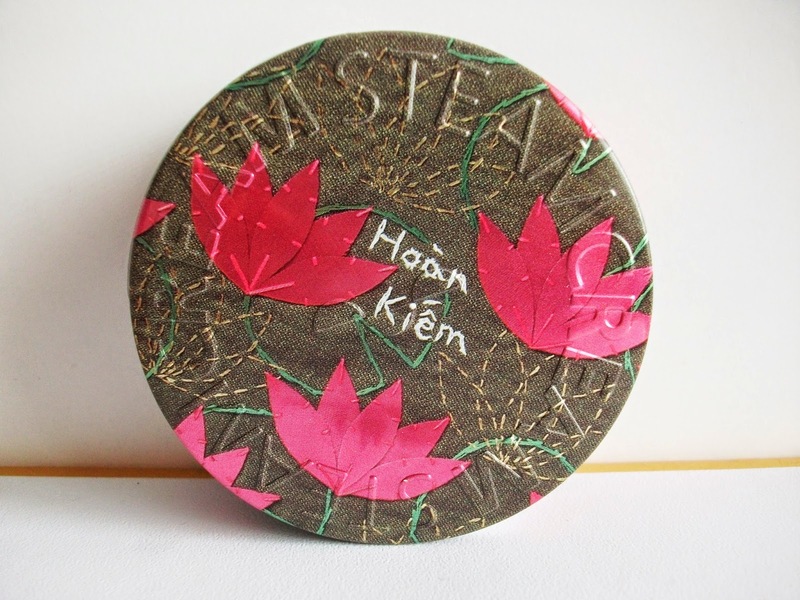 This tin of SteamCream I received is called Hoàn Kiêm and it's a new but limited edition tin. STEAMCREAM's latest collaboration is with talented Japanese poet, designer and embroidery artist Mako Kikkawa. Mako Kikkawa was inspired by the majestic Hoàn Kiêm Lake in Hanoi, the capital of Vietnam, and this design was carefully embroidered by hand and transformed into a beautiful tin. The Hoàn Kiêm Lake is both the historical centre of Hanoi and a focal point for public life. Water is just as important to this scenic lake as it is to the production of STEAMCREAM. Using pure water, heated under a pressure greater than 100°C, a shot of steam powerful enough to fuse the natural ingredients is harnessed, forming STEAMCREAM's smooth, light texture. 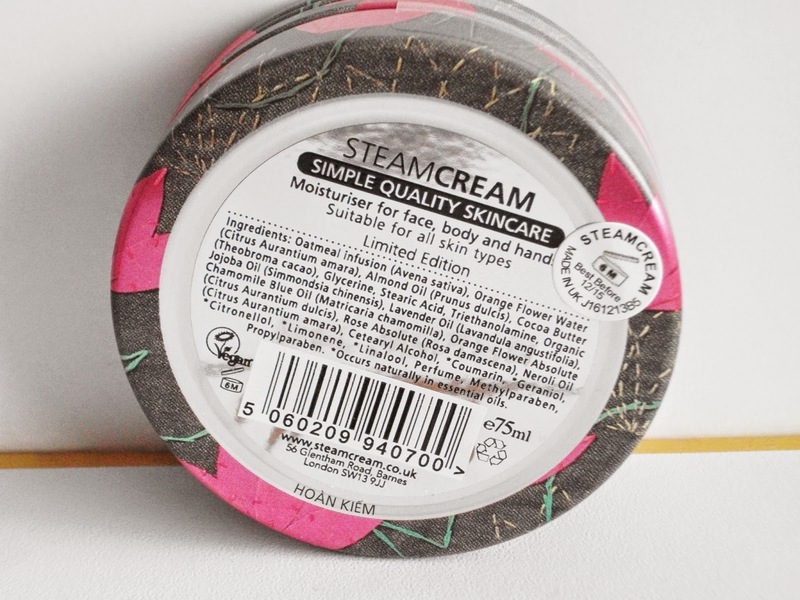 The steam process is not only how STEAMCREAM got its name, but is what makes it such a unique and effective moisturiser. Many creams on the market use complex molecules to bind their ingredients, which gives them a heavy emulsion that sits on the surface of the skin and only moisturises the outer layer. Because STEAMCREAM is so light and loosely bound it penetrates into your skin leaving it smooth, supple and flexible for longer, and without all the nasty chemicals STEAMCREAM is able to invest in top-quality raw materials like orange flower water, almond and jojoba oils, and rose absolute. 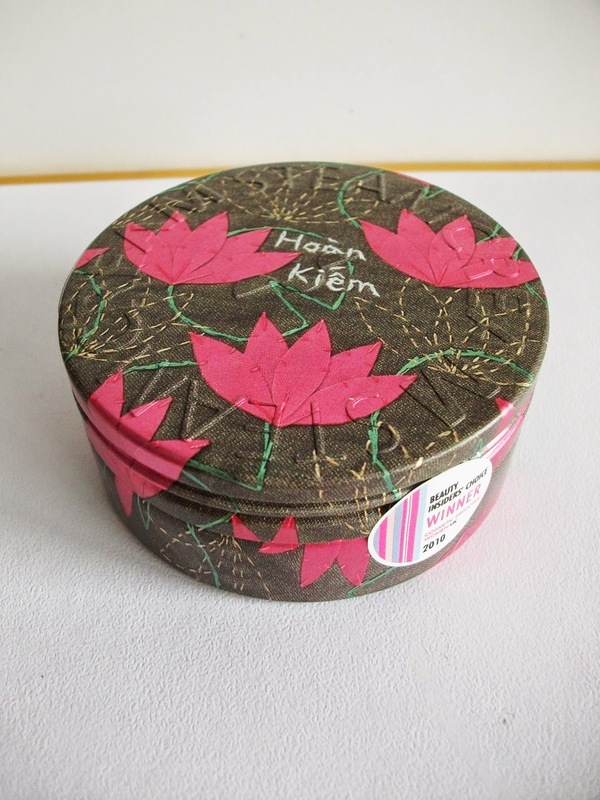 The tin is about 7cm diameter and 3cm height, so it's nice size. What's great about this is that when you're finished using the cream you can use the tin as storage. It can even act as a decor in your room it's that pretty! The thing I like about SteamCream is that you can use it for your face as well as body and hands, and also not to mention that the cream is handmade using natural ingredients! This would make a perfect gift for people any body! SteamCream tins come in many designs suitable for men and women from every age group. Any one at the receiving end of this would most definitely have no complaints and I am almost certain will love this product. Love at first sight perhaps? It's quirky, different and one of a kind, what's not to love? This one they've sent me is one of their limited edition tins, so if you are looking to get one for yourself, I'd recommend you do it sooner than later! I have never heard of either products before the lovely Rosie sent me an email asking if I would like to sample and review these products. I was intrigued and gratefully accepted and I'm so glad I did. These products, even though I have yet to try the out, have given me a very positive first impression. So much so that I can't wait to use them! Stay in tune as I shall give a full review of the both products in a couple of weeks! Have anyone else tried these products yet?? What do you think? Omg this products look & sound fantastic! I haven't heard of this brand before but now I am so intrigued. Your typical Irish-born Chinese who loves to indulge in things delicious, beautiful and fun! STOP your huge spot/cyst from growing! !